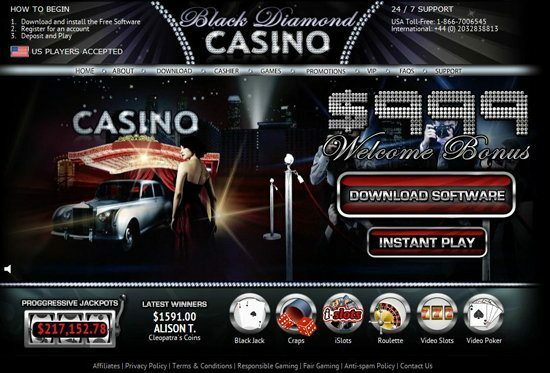 Black Diamond Casino invites all new players to try the casino without risk or obligation via a $25 no-deposit bonus. The $25 bonus is awarded as 25 free slot spins after registering your new account. If you then decide to stick around, you can verify your account and make a deposit, and then take advantage of several deposit bonuses and reload bonuses! Register with the Black Diamond bonus code 25FREESPINS to ensure you receive your 25 free spins. Click here to register and get your free $25! Black Diamond awards all new players $25 immediately to play with just for registering an account, no deposit required. Unfortunately, you cannot withdraw the bonus or any of its winnings, rather the winnings are added to your bonus when making a deposit. You must fill out the registration and profile information fully and accurately. The no deposit bonus AND the winnings from the bonus cannot be withdrawn, but when you make your first deposit, your winnings are exchanged for an extra first deposit bonus of 100% up to $100. In other words, you can increase your bonus amount by $100. If you do not make a deposit, you cannot take advantage of your winnings in any way. 25x wagering requirement on the deposit and bonus amounts. The bonus is sticky, not cashable, so can only be played with and not withdrawn. 100% for all slot games, 20% for video poker, 10% for casino war, mini-baccarat, keno and weed whacker. 100% for all slot games, 20% for video poker, 10% for roulette, casino war, mini-baccarat, keno and weed whacker, 2.5% for blackjack. Go to the Black Diamond Casino website. Click on any of the large red buttons labeled Download or Play Now. Save the setup package to disk and then run it. Once the program installs, it will start the desktop client for the first time and then guide you through registration and verification. Note that the desktop client requires the Windows OS. Alternatively, you can click one of the large red buttons labeled Instant Play. That will start the no-download casino. Click the large green Join Now button to register. If you need assistance at any point, simply click the 24/7 Support button at the top of the webpage. 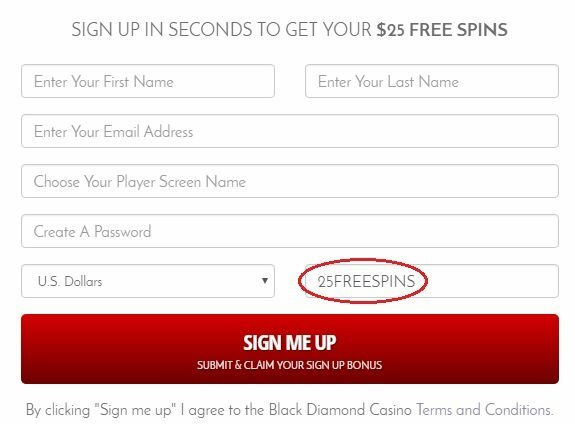 Then to receive your free $25 no deposit bonus, simply register a new account, and Black Diamond Casino will automatically offer you the no-deposit bonus. You do not have to set up payment information at this point, but it will be necessary later if you choose to claim winnings from it or opt to take advantage of a welcome bonus. To claim the welcome bonus, go to the cashier and then make a deposit of at least $25. When making your first eligible deposit, the cashier system will recognize that fact and give you the option outlined above. On subsequent eligible deposits, the system will recognize what track you are on and apply your bonus automatically. The no-deposit bonus and the option-A welcome bonuses cannot be used on blackjack, craps and roulette. The system is automated and will simply deny you access to those games while such a bonus is active. The option-B welcome bonuses have no such limitation. The casino does not allow bonus money to be cashed out. Therefore, when a client exercises his or her right to withdrawal, the casino will first deduct any initial deposit amounts. Note that on the no-deposit bonus there is a winnings cap of $200, and upon withdrawal, any amount in excess of $200 will be voided. The wagering requirement on the no-deposit bonus is 99 times the bonus amount or $2,475. Therefore, if you played the $25 as a single chip on a slot machine and hit a $3,000 pot, $200 would be take-home, $2,475 would cover the wagering requirement and $325 would be voided. The standard wagering requirement is 25 times the bonus and deposit amount, and this applies to both option-A and option-B. The maximum value of option-A is $999, which requires an overall deposit amount of $1,298. The total play-through requirement would be $57,425. The maximum value of option-B is $300, which requires an overall deposit amount of $800. The total play-through requirement would be $27,500. Most games contribute to the wagering requirements fully. There are exceptions. Video poker contributes 20 percent. Roulette and Keno contribute 10 percent. The Keno contribution rate in particular is unusual and best avoided by Keno players. Blackjack contributes only 2.5 percent, and this limitation is on top of the fact that the blackjack-eligible welcome bonus is already significantly reduced. In addition to the no-deposit and welcome bonuses, Black Diamond Casino provides a daily offer, Monday through Sunday. Although the terms of the offer vary each day, each offer is essentially a reload bonus, and on Tuesdays, for instance, you can deposit $500 and receive a 200-percent match bonus. Click here to open your account and receive your free $25 no deposit bonus! The Black Diamond Casino is operated by Deckmedia, the same group that operates the Miami Club Casino. See our review of the Miami Club bonus here. fun to play with free money but be aware that you can't withdraw anything from it - but if you win, it gets added to your welcome bonus you can get something! Thanks.